Two days ago, I was on the way back to my house in the center of Vicenza after a nice day in the country. Suddenly, I found myself in the unfortunate position of being stopped in an unexpected traffic jam on a narrow road only one kilometer from the city center (just after passing Palladio’s ‘La Rotonda’ villa). As I inched along on the out-of-the-way detour indicated by traffic police, I came to realize that the reason for the stoppage was simple: a calcio match (Italian for ‘soccer’) had just finished. Tifosi (fans) of Vicenza’s team, nicknamed the ‘Biancorossi’ (white and reds) after the team color’s, were happily marching down the sidewalks loyally displaying their team scarves. Then the traffic totally stopped. Gradually advancing towards me from the other lane was a war zone on wheels. First, there was a black, armored, tank-like vehicle of the Carabinieri, the Italian para-military police force, followed by…a privately-contracted, double-decker bus full to the brim with young soccer fans from somewhere or another. They could be seen pressed against the windows of the jam-packed bus, screaming unintelligible obscenities at anyone watching, proudly waving middle fingers out the windows, and generally engaging in near-riotous behavior on board their own bus. Each bus echoed the variations of the same theme, and each bus was separated from the previous one by another armored police car full of riot-gear-clad Carabinieri. There were a total of ten such buses, and ten police ‘tanks’. It is unclear who the police were protected–the small army of hooligans, or the (tax-paying) population at large. It was very clear, though, that something was dreadfully wrong with this situation (even beyond my taking an hour to get home from what would have been a 5-minute walk, and my generally soured mood after what had been a nice autumnal Italian Saturday). I later discovered that Vicenza had been victorious in a match against the team from Verona, which I can only assume is an ancient and bloody feud between the two neighboring cities (who can now only win annual ‘moral’ victories by proxy, by way of the prowess of their respective second-tier-league soccer teams). I also discovered that Rome, this very same day, had witnessed a fully-realized display of violence that seemed to be rooted in a similarly anarchic ideology that I had just seen in person. Rome was to be one of dozens of cities worldwide that would host protests both inspired by and in solidarity with the Occupy Wall Street movement taking place in New York over the last month. The turnout of peaceful protesters in Rome was possibly the largest in the world on this simultaneous ‘Day of Rage’ (as I have heard it referred to). There were over 100,000 protesters from around the peninsula who descended on Rome to voice their discontent with the ineffectual and corrupt government, rapacious bankers, and Berlusconi (among other things). This peaceful march was hijacked, and used as a shield against the police, by an organized group of a few hundred young men. This relatively small group arrived wearing all black, with masks and motorcycle helmets, and weapons. They uprooted cobblestones to throw at police and into windows, set cars ablaze, and caused widespread mayhem for several hours without any effective response by the police. In the end, only 12 of the group were arrested, and something like 200 policemen were injured. First of all, let me comment about the political response. It is no surprise that such a savvy media manipulator as Silvio Berlusconi (he actually owns most of the media, in fact) was quick not only to denounce the violence of the group (obviously), but to also openly associate them with the ‘Leftists’, his vague characterization of a faction who also happen to be Berlusconi’s political rivals. Many of his loyal lackeys followed suit and condemned the ‘Left’ for the violence. This is absurd on many levels. The fact that the enormous protest was overshadowed by a dedicated group of anarchists is already a victory for the likes of Berlusconi, who needs all the distractions he can muster in order to continue to divert attention away from his desperate, power-hungry attempts to cling to office as long as humanly possible (he is currently the defendant in no less than FOUR lawsuits at the moment, while ostensibly ‘serving’ as Prime Minister). 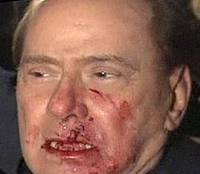 This dastardly character may not have caused Italy’s systemic political dysfunction, but he has certainly exacerbated it and used it to his benefit whenever possible during his 10 years of rule (over the course of three terms). At this point, it is painfully transparent to attempt to blame such wanton violence on his opponents–this is an old tactic that can be seen in such examples as the burning of the Reichstag in 1933. It is not fair to blame Berlusconi for this event, but he should certainly be held responsible for helping to create or perpetuate the conditions whereby such events are more likely to occur. As one blogger writes, “It’ll only get one result: to scare the vast majority of Italians and nurture in them a desire for a strongman.” Luckily, Berlusconi will never be that strongman, but the fact remains that such relatively minor skirmishes always provide occasion for any would-be strongmen to consolidate power at the expense of civil liberties (maybe another day I will write about Bush’s “Patriot Act”, something straight out of Winston Smith’s “Ministry of Truth”). Next, I would like to examine why such violence happened at the protests in Italy, and nowhere else. We must obviously recognize that such things, while unexpected and condemned by the majority of Italians, are by no means unheard of in this country. There is a long history, even since WWII, of violent political groups and chaotic protests here. The leftist ‘Red Brigades’ orchestrated a series of terrorist acts and assassinations during 60’s, 70’s, and into the 80’s. Right-wing and anarchist groups also continue to perform acts of violence–the ‘Black Bloc’ group responsible for Saturday’s riots is an example. In 2002, there was a violent confrontation in Genoa at a protest of the G8 summit. Strikes and protests in Italy are not uncommon, and they do occasionally end in some type of violence or destruction. In my own town of Vicenza, since 2006 there has been an ongoing and well-organized protest movement called ‘No Dal Molin’, which is fighting against the expansion of an American military base into an old local airport. Despite huge support for the movement (95% in one vote), the fight has basically been lost, as the base has been approved at all levels of national government, and construction has been underway for a couple years at Dal Molin airport. This movement has sponsored scores of peaceful marches and occupations of local building and landmarks, but also, on at least two occasions, their own train station was occupied and ransacked by various protesters. Soccer violence is common around Europe and around the world, and Italy is no exception. Inter-city matches often descend to levels of chaos and animosity not usually witnessed outside of full-fledged wars. The case of a policeman murdered by hooligans in Sicily in 2007 is but one of the most infamous examples. I don’t pretend to know all the answers as to why violence is more prevalent in some societies, but I do have some ideas about the solutions. However over-optimistic it may seem, a society in which people have freedom, opportunity, and at least a notional voice about how the government works will always be more stabile, prosperous, and peaceful than societies without this. Italy, however wealthy and steeped in culture and history, is home to one of the most ineffective, inefficient, and overly-bureaucratic governments in Europe. The economy is stagnant and young people feel like they have no opportunity here, and no ability to change the huge political problems their country faces. This is a recipe for potential violent confrontations. There is another way, though. I have already praised the Occupy Wall Street movement in this post. The good thing about this movement is that seeks to exert political influence in a peaceful, and totally democratic, way (it is really the very definition of participatory democracy). It understands that violence does not improve anything, especially in politics, and that the best method for creating an effective system of reforms is to publicly express dissatisfaction that gains the attention of hordes of sympathetic citizens, journalists, and, ultimately, politicians. As Thoreau said, “A man more right than his neighbors already constitutes a majority of one.” Any group fighting injustice even against entrenched powers that want to maintain the corrupt status quo will always have the moral high ground (or maybe the ‘moral majority’). Let more people join these movements and influence the issues, and let our societies gradually seek to move more towards a new contract of political freedom and justice. But let it always be non-violent. Hopefully, these movements will continue to grow and to remain peaceful, just as our friends in the Syrian resistance continue to be, even in the face of thousands of thousands of wrongful deaths and imprisonments. I completely agree with your point that football violence and what happenend in Rome is rather stupid. (In Genoa it is a bit questionable how much destruction was actually done by the protesters andwhat was done by undercover police men, but that’s a different topic). I also agree with the fact, that in our modern Western societies it is important to win over the journalists/broad masses and you can’t do that by using violence. One could see the huge success of letting yourself get beat up by police in Stuttgart this year (https://en.wikipedia.org/wiki/Stuttgart_21#Debate_and_opposition), so it kinda works. But would you disregard violence completely? I was a bit surprised by the example of Syria. I mean there already is armed resistance and I can quite understand it. I’m not comparing Assad to Hitler or anything, not the point of the quote, just also kind of my opinion. With Syria one could of course argue that sooner or later peaceful protest will overthrow Assad at lower cost than an armed uprisig would take, but would you generalise that? I’m rather pessimistic about the effectiveness of the OWSmovement, but again, different topic. I certainly do not disregard violence in the proper contexts. I appreciate your reference to Orwell, and I hope to write about the Syrian question soon, because it is of grave importance. 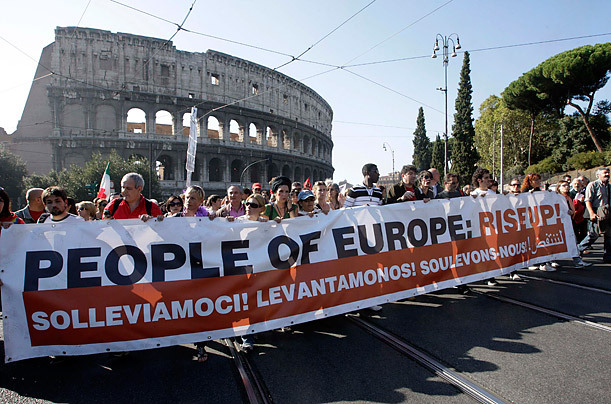 The Rome protesters were peaceful, like the similar events around the world. There was only a certain organized group that initiated chaos and actually attacked the police, etc., rather than the much-different situation of the police attacking peaceful protesters. In our (relatively) civil societies in Europe and America, our protests have no excuse for any violence of any kind, given our present freedoms of speech/assembly, etc. People in China, Russia, Syria, and many other countries cannot claim such a happy privilege, and violence is often ubiquitous. I wish for non-violent solutions, especially in our societies where they are not (currently) needed, but understand perfectly the situations in which they are required. I don’t necessarily agree with Augustine’s qualifications for the ‘Just War’, but I do agree with the concept.